This 19th century building definitely isn’t the oldest hotel to feature on Nights in the Past, but during its time it has certainly welcomed many famous figures, both Spanish and international. Stay here and you will be following in the footsteps of the likes of Orson Welles, Charlie Chaplin, Pablo Sarasate, and Kings Alfonso XII and XIII among them. However, perhaps of even greater historic interest is that the very room in which Ernest Hemingway stayed is available to guests. 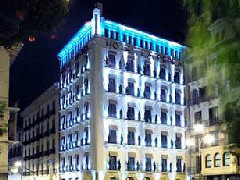 The Gran Hotel la Perla is 5-star rated and situated in the heart of the city on the Plaza del Castillo.